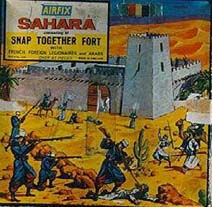 This snap-together fort comes complete with ready-to-paint )) scale figures of Arabs and french Foreign Legionaries. The set makes up with authentic battle scenes between these traditional enemies. Fort and figures available separately.